"The Oregon Trail" probably provided one of your first gaming experiences. If you're in your 30s or 40s, chances are you have fond memories of "The Oregon Trail." The iconic PC game probably provided one of the first gaming experiences, and it was even part of the curriculum for some schools in the early 1980s. You could spend hours trying to successfully lead your team of settlers across the country, stopping along the way at outposts to buy supplies and hunt bears, squirrels and deer. You also died — often — as a result of old-time maladies like typhoid and dysentery. Now you can re-live that childhood experience thanks to a deal on Amazon, where a handheld "Oregon Trail" game is on sale for $10. 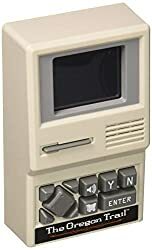 It promises to be true to the original game, and its beige-and-black casing and thick buttons recall memories of early PCs. Note that the game doesn't ship for one to two months, so you might be able to make it across the country and back before it arrives at your house.